(AINA) -- Dr. Anahit Khosroeva is a Senior Researcher at the Institute of History, National Academy of Sciences in Armenia, and has been a scholar in residence at North Park University in Chicago, USA, where she taught a course on 20th century genocides. She is a member of the International Association of Genocide Scholars. Her Ph.D. dissertation is titled The Assyrian Massacres in the Ottoman Turkey and the Adjacent Turkish territories (End of the 19th to the First Quarter of the 20th Century). She is the author of the several books and numerous articles on the history of the Assyrian people, written in Armenian, Russian and English. Her recent publications are The Assyrian Genocide in the Ottoman Empire and Adjacent Territories (The Armenian Genocide: Cultural and Ethical Legacies, Edited by Richard Hovannisian, New Brunswick, New Jersey, Transaction Publishers) and The Armenian and Assyrian Massacres in the Ottoman Turkey as the First Example of the Genocide (Research on Armenian Genocide, Budapest). Dr. Khosroeva will present a paper, titled The Assyrian Genocide in the Ottoman Turkey (late 19th early 20th century), in Buenos Aires at the 9th Biennial Conference of the International Association of Genocide Scholars (July 19-22). AINA conducted the following interview with Dr. Khosroeva. What made you interested in the study of the Assyrian genocide? I was a Ph.D candidate at the Institute of History at Armenian National Academy of Sciences and was working on my dissertation about Ethno-demography in Trabizond (one of the six regions of Western Armenia) before World War I. After two years of research my advisor asked me to prepare a small presentation about the Assyrian Genocide, because a delegation of Assyrians from the U.S. was coming to visit Armenia for the April 24th Armenian Genocide Remembrance Day and participate in the annual conference about Genocide. My mother is Armenian and my father is Assyrian. I knew, therefore, that both nations were subjected to Genocide in Ottoman Turkey. I had difficulty finding material for the presentation on the Assyrian Genocide. Somehow I made it and I remember it was very successful, but I decided I was not going to stop and I changed my dissertation subject and started to work on this issue, because it is not only a very important subject for me and Assyrians, but it is a subject which needs scholarly work. The Assyrian Genocide question needs international recognition. Immediately after I finished my Ph.D, the Primer Minister of Armenia, Mr. Andranik Margaryan, who was the chairman of the Board of the 90th Anniversary of Armenian Genocide Commemoration, saw the importance of bringing awareness to the Assyrian Genocide and sponsored the publication of my first book in Armenian, titled The Assyrian Genocide in the Ottoman Turkey. The book was translated to Russian one year later and was published by the support of of my two Assyrian friends, Walter Veniaminov and Ruben Aleksanov. 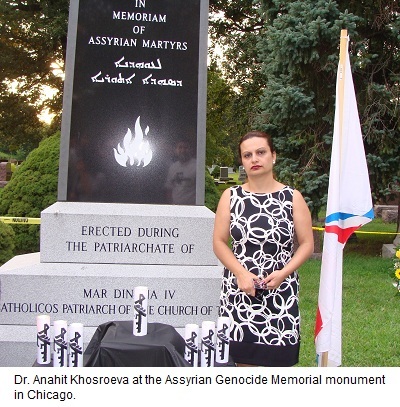 In 2007 Dr. Normal Solhkhah of Chicago sponsored the publication of A Brief History of the Assyrian Genocide in Words, Pictures & Monuments, in English. When did the WW1 genocide start? On August 1, 1914 World War I broke out. Already by September 1914, more than 30 Armenian and Assyrian villages in the region surrounding Urmia, Iran were burned and destroyed. Thousands of people were killed. The Russian vice consul, Vedenski, visited these places and said in his report "the results of jihad are everywhere." Rev. Joseph Naayem, the Chaldean Assyrian priest in Diyarbekir, Turkey, reported that massacres started on April 8, 1915. Was the WW1 genocide part of a larger pattern? Yes, Turks wanted a religiously homogenous empire, incorporating all the neighboring territories populated with Muslims. This was their goal and they did everything to reach it. The Young Turks' party program stated "…sooner or later all the nations under Turkish control will be turned into Turks. It is clear that they will not convert voluntarily and we will have to use force." During one of their secret meetings Dr. Nazeem, a Young Turkish ideologist, said "The massacre is necessary. All the non-Turkish elements, whatever nation they belong to, should be exterminated." The Young Turks' decision to enter WWI hinged on their belief that "participation in the war will considerably raise Turkey's authority, satisfy their vanity and dignity." During a talk with Dr. Mordtmann, an employee of the German Embassy, Turkish Minister of Interior Talaat Pasha said exploiting the opportunity of martial law, the Turkish government would eventually get rid of its internal enemies --- the Christians -- without fear of foreign diplomatic intervention. The ensuing events would bear out this sentiment, as millions of Assyrians, Armenians and Greeks fell victim to the Turkish genocide while the world's great powers remained silent. Did the Ottomans differentiate between Assyrians, Greeks and Armenians in carrying out the Genocide? No, they were all seen as Christians. Was the Genocide anti-Christian? Were there non-religious motives for the Genocide? Yes, it was anti-Christian. The goal was to have a homogeneous Turkish country, and the Christians were in the way and had to be eliminated. A secondary motive was the plundering of Christian wealth, because they were professionals and businessmen. Was Islam a fundamental driving force of the Genocide? Yes, it was. Sultan Abdul Hamid II rose to the Ottoman throne in 1876, and he governed with an iron hand for 33 years. He introduced individual and mass murders into the Ottoman political culture as a method to settle the problems of the Empire. A pivotal theme of sultan's external and internal policies was Pan-Islam, which sought a religiously homogenous empire joining with Turkey all the neighboring territories populated with Muslims. To this end, the nationalist aspirations of non-Muslim elements in these regions were suppressed. During World War I the manner in which the massacres were organized and implemented serves as irrefutable evidence of the Turkish government's decision to eliminate a people whose nationalism and Christian identity ran contrary to the Young Turks' own ethnic and religious chauvinism. What role did the Kurds play in the Genocide? Established by and named after Sultan Abdul Hamid II in 1890, Hamidiye Kurdish Cavalry were intended to be modeled after the Russian Cossacks and were supposedly tasked to patrol the Russo-Ottoman frontier. The Hamidiye corps was well-armed, irregular Kurdish cavalry formations that operated in the eastern regions of the Ottoman Empire. However, the Hamidiye were more often used by the Ottoman authorities to harass and assault Assyrians and Armenians living in Western Armenia. Multiple sources say a large number of Assyrians and Armenians were killed by this Kurdish cavalry, and women and girls were taken to their harems during 1895-1896 massacres and World War I. How many Assyrians were killed in the Genocide? 1 Editor's note: The Russian geographer Lilian visited the Assyrian homelands before WW1 and estimated the total Assyrian population at 1 million (see here). Demographic studies of the Middle East show the population has increased approximately tenfold since WW1. Assuming the Assyrian population has also increased tenfold, and it is about 3.5 million now, the population must have been about 350,000 then -- if there were no genocide. If we accept Lilian's population estimate, that the Assyrian population was 1 million just before WW1, then about 3/4th of Assyrians must have been killed, else they would number 10 million now.